Watch this video to learn how ice dams form and how Triple H Home Efficiency Experts, your local Dr. Energy Saver contractor, can help prevent them! While a roofing contractor can provide a temporary solution to your ice damming problem, Triple H Home Efficiency Experts can prevent future ice dams by sealing air leaks and improving the insulation in your attic. Call us at 1-866-977-6917 or click the button below to request your in-home energy audit and free estimate! We service Brookhaven, Islip, Huntington and surrounding areas. Ducts must be sealed to prevent leaks in an attic and insulated well to prevent heat loss (and heat gain in the summer). Your furnace may heat the air up to 100 degrees or more and send it through leaky sheet metal ducts through a 30-degree attic. It's inevitable that heat gets into the attic it's running through. This means you get less heat delivered to the room intended - so you have to run the furnace more to keep your home heated - and that costs you money. For an effective solution to your ice dam problem, contact the energy specialists at Triple H Home Efficiency Experts today to request an inspection and get a free estimate to upgrade your home insulation. 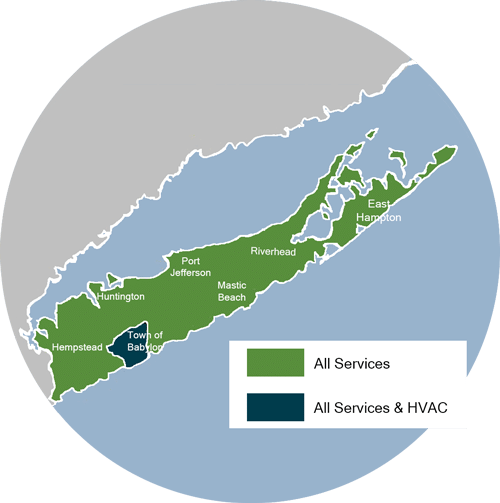 We work in Brookhaven, Islip, Huntington, Smithtown, Huntington Station, Bay Shore, Brentwood, West Babylon, Ronkonkoma, Central Islip and throughout the state.